Cst. Mcfarlene, President Cor De Wit, Mayor Whaley. 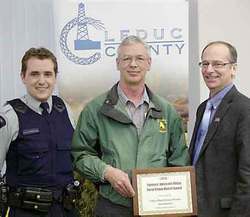 The Farmers’ Advocate Office (FAO) has announced that the Leduc Rural Crime Watch Association has been awarded their 2013 Award for Excellence. The award was established in 2007 and is presented at the FAO provincial annual meeting, along with a grant. This award is presented to a local rural crime watch association each year that show initiative and innovation in delivering their services to members and the public at large. The award is based on one of three or more of the following factors. How the association is able to provide consumer protection for rural Albertans, the rural opportunities available to rural Albertans, and to ensure rural Albertans have an opportunity for a fair process. Leduc Rural Crime Watch Association was singled out for the unique use of sandwich boards that were placed around the county, as well as an informational brochure that promoted the services provided by the Association. The Leduc Rural Crime Watch Association was established in 1983, out of concern for an increase in rural criminal activity and a desire to assist the local RCMP detachment. Today there are over 900 rural households that are actively participating in the Association. Members report suspicious activity to the RCMP for their potential follow-up and investigation. On Tuesday, April 8th at the Leduc County Council meeting, Leduc Rural Crime Watch President, Cor de Wit, and Cst. McFarlane presented to Council and accepted by Mayor Whaley the Award of Excellence plaque from FAO.